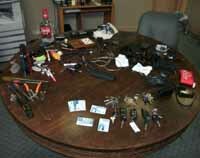 Hailey police display some of the items recovered from a rash of car burglaries in the south valley. Hailey police reported Monday that multiple vehicle burglaries are now being solved in Hailey and Bellevue as a result of a routine traffic stop last week in Hailey. "We've cleared 15 burglaries, and we expect to clear another 20 to 30," said Hailey Police Chief Jeff Gunter. In a joint investigation headed by Hailey Lt. Steve England, the Hailey Police Department and the Bellevue Marshal's Office had been investigating a rash of vehicle burglaries in the two towns within the past month. Gunter said the investigation gained momentum Thursday when numerous stolen items were found in the vehicle of a 17-year-old boy who was stopped for a traffic infraction. "We were developing information before, but that was the case breaker," he said. The police chief said between $8,000 and $10,000 worth of goods has now been recovered, including camera equipment, cell phones, iPods, stereo systems, GPS systems, sunglasses and personal identification. Gunter said six people—two adults and four juveniles—are being charged. The only name released so far is that of Cody Swenke, an 18-year-old Hailey man. Gunter said Swenke was issued a citation charging him with misdemeanor possession of stolen property. He said the other five suspects are being charged with felonies, including burglary and grand theft by possession of stolen property. "Our goal right now is to get all the property back and get it back to the owners," Gunter said. "We're asking anyone who is missing anything from their cars over the last four weeks to give us a call. "This is one of the biggest burglary cases I've seen since I've been here."